Definition of action – The fact or process of doing something, typically to achieve an aim. We all have dreams and goals, yet it seems few people ever transform their desires into reality. While I have written about this topic frequently, the question still remains, why is this? Have you, like so many other people often wondered what prevents you from doing the things you know you should do to achieve your goals? And then, exactly how to get into action and achieve your goals and fulfil your dreams? ‘I need more time to think about it.’ blah, blah, blah. How to get into action? While I am adept at helping people get out of their own way, changing their poor habits and behaviours so they can do the things they truly want to do, the last comment above – ‘I need more time to think about it,’ really resonates with me. Yes, I will admit. I love being a thinker! It’s been something I have fostered all my life. We tend to fall back into our habitual ways of doing things, and unless we identify and address this, it can block forward momentum. Chances are, you are possibly the one getting in your own way too? And you probably aren’t even aware that you do? When I travelled the world with carefree abandon, my thoughts would drift off into the land of imagination, or percolate on some concept or idea, with no great conclusion. The trouble is, if we hang around here too long, we get nowhere fast in the action arena. My love of thinking was explained when I took the Myer Briggs Test many years ago and discovered, much to my excitement, that I was in the same quadrant as Carl Jung – a philosopher and thinker. While it explained so much to me at the time, it didn’t give me any strategies to transform this thinking into action. Then I took instant action. Non-negotiable. READY FIRE AIM, rather than READY AIM FIRE… resulting in forward momentum. This strategy can be used in any area of life. For example, it helped help me get back into sport after quite a severe injury which various medicos said required a lengthy recovery. I ruptured my talo-fibular ligament (Level 3) in my foot, so transitioning from a runner to being on crutches and in pain, was a blow. Lengthy recovery ranged from 12 to 18 months. So, while I have never taken much notice when people place limitations on me, I decided I needed to take charge, make an action plan, work out how to get into action and create a focus on getting back into running. Decision and action are pivotal when wanting to change. I called my plan, ‘Every step is a step nearer.’ These words were my mantra when I competed in the Hawaiian Ironman. It was instrumental in completing the exceptionally tough 42.2km run leg of the triathlon. Just focusing on the next step. Then the next, and the next. Yes, one step at a time, no matter how arduous, gets one through to the end. Therefore, this same strategy was used in healing my injury-one step at a time. So, with the help of two amazing clients, Dave Liow, Exercise Physiologist, and Jenny Van Leeuwen, Physiotherapist, a series of Step by Step exercise plans were formulated. ‘First, it was walking gingerly on crutches and doing some simple ankle exercises; then it was doing squats on a wobbly ball, walking, flexing and stretching my ankle, then more advanced ankle movements, healing techniques at night (taken from my vast tool-box of techniques) and progressed to treatment with new technology by, Jenny Van Leeuwen, a caring and expert physio. ‘Lorenzo’ is the machine’s name! Later it was walking, walk/run, then short runs, before going back to the Park Run (5km), back into yoga and then longer runs. 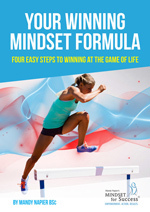 I set an Intention and created my own mantras and POST’s (Positive Statements) that I said every day, plus other Mindset Strategies including mental rehearsal, visualisation and creating the feeling of having completed the race. Amazing results pursued, well within the time-frame put forward by well-meaning medicos. Time and patience and consistency really work! Eight months later, from what seemed such a massive task, I have completed a 17 km run and clocked up several one-hour runs, and ran three to four times a week. It’s been challenging getting back into running, at the level, I used too. There have been days when I have felt lacking in energy, where my body has not wanted to move beyond the old ‘slow’ plod of former distance running days and days when I have felt like stopping. I have had a few pains in my ankle and a slight tendency to wobble as my ankle still doesn’t quite feel entirely attached to my leg! Despite this, I find myself in a place where in a few days time I will be lining up at the Sunshine coast half-marathon to fulfil the goal I set not long after I ruptured my ligament. Small consistent steps are how I am here. One step after another, despite doubts and slow progress. Moreover, despite what anyone else said this is a sure way and how to get into action and build momentum. My small action steps have built my fitness, belief and my vision of seeing myself crossing the line. (When I hurt my ankle it was a hard picture to see). The clarity has fuelled more action which has built belief and again, fuelled more action. Ticking off the small action steps meant my brain regularly sent me a short of serotonin, ensuring I felt a sense of achievement; fuel to keep going. So don’t wait for the right time, the perfect conditions, until you have enough money, belief or clarity. Get into action now. Simply do it. Get READY, FIRE and AIM. Implement your own Get Into Action Plan and in the words of Nike, Just Do It. Keep this question where you can read it often. Then simply ask ‘How can I get into action easily right now?’ Note, you don’t have to answer this one. You are asking for help from the Universe! If that doesn’t cut it, how about the following straight to the point quote below? How to get into action is achieved by making a decision to start small. Taking small steps that while they may seem easy or simple, will be easier to maintain and over time will build great things. Mandy Napier BSC (Sunshine Coast, Australia) is a Global Mindset & Performance Coach who inspires people to get out of their own way, step up and become the peak performer in every area of their lives; living their true potential.